(NaturalNews) The missing link behind what causes gluten intolerance and celiac disease, and why prevalence of these two autoimmune conditions has risen dramatically over the past several decades seemingly without cause, may have more to do with how conventional wheat is grown in the U.S. today rather than what it contains naturally. Like with the massive rise in autism spectrum disorders, the scientific community is trying to explain away the near-tripling of celiac cases over the past 20 years as being a result of improved detection and diagnosis techniques. Many people simply weren't aware that the condition existed back in the 1990s, some scientists claim, dismissing any other outside causes. 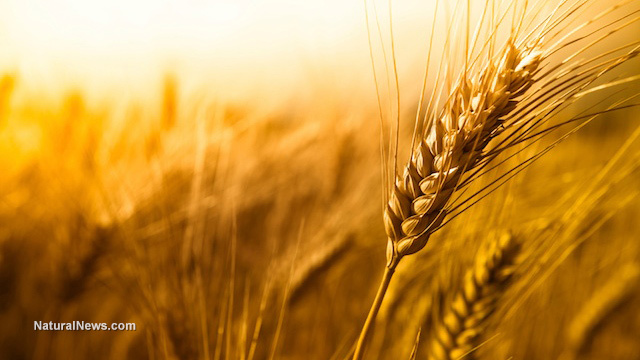 But the evidence increasingly points to the chemicals applied to modern wheat crops, primarily in the U.S., as a major driver behind this epidemic of supposed gluten allergies. Monsanto's Roundup herbicide, which contains glyphosate, is often applied to conventional wheat crops at the end of their life cycle, leaving behind residues of the chemical formula on the wheat consumed by millions. This little-known process, which was recently brought to light by The Healthy Home Economist, allows farmers to harvest wheat early and produces a slightly higher yield. But the consequence is contaminated wheat, which ends up being made into breads, cakes, crackers and other consumer products. U.S. Department of Agriculture (USDA) data from 2012, the latest available, reveals that 61 percent of winter wheat, 97 percent of spring wheat, and 99 percent of durum wheat grown in the U.S. is treated with Roundup just prior to harvest. This is up from 47 percent of winter wheat, 91 percent of spring wheat and 88 percent of durum wheat treated in 1998. According to one U.S. wheat farmer, the application of Roundup to wheat plants at over 30 percent kernel moisture results in the plants actually abosrobing Roundup and distributing it into wheat kernels. These kernels are later ground into wheat flour, which is then processed and turned into various wheat-containing foods consumed by millions of Americans. "Consumers eating products made from wheat flour are undoubtedly consuming minute amounts of Roundup," said wheat farmer Keith Lewis, as quoted on the Wheat Belly blog, about this completely unlicensed practice. In a study published in the journal Interdisciplinary Toxicology, Massachusetts Institute of Technology (MIT) researcher Stephanie Seneff and her colleague Anthony Samsel plotted available data on celiac diagnoses and glyphosate use on conventional wheat crops over the past 20-or-so years and concluded that both have risen correspondingly. "Celiac disease is associated with imbalances in gut bacteria that can be fully explained by the known effects of glyphosate on gut bacteria," explains the study. "Characteristics of celiac disease point to impairment in many cytochrome P450 enzymes, which are involved with detoxifying environmental toxins, activating vitamin D3, catabolizing vitamin A, and maintaining bile acid production and sulfate supplies to the gut."